The Chinese yuan is skyrocketing in value. 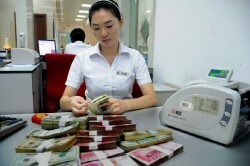 An employee of a bank in Beijing is counting money./ Source from search engine Baidu. 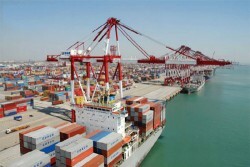 By Hong Soon-do, Beij..
Chinese economy in "hard landing"
A pier in Shanghai where goods are gathered for exportation. It seems to symbolize China's economic boom, but it is not the case now./ Source from se.. The Fourth Plenary Session of the 18th Central Committee of the Communist Party of China held last year. At the upcoming plenum in October, the Chine..